Read Kathy' article "Inclusion, Family Style" featured in Exceptional Parent Magazine February 2014. Are you there, God? You have to show me how to raise this child. Because the skills I've learned over the years just aren't working here. I'm helpless, Lord. I can't do this on my own! Statistics from the U.S. Census Bureau report that 2.8 million children in the United States have a disability. That means more than 5 million parents, grandparents, and caregivers have probably offered up a prayer like this. Raising a child with a disability is hard work. Where do you go for solace? For rest, refreshment and renewed joy? We know where to go for our kids, but where do we go for ourselves? Author Kathleen Deyer Bolduc knows these feelings from experience. She and her son navigated through his childhood and now approach yet another new life phase -- adulthood -- and all that entails. 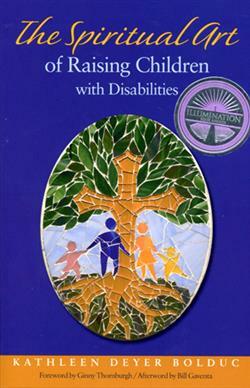 In The Spiritual Art of Raising Childre with Disabilities, Bolduc uses the metaphor of the mosaic to life as parents of children with disabilities. How do you rearrange the fragmented and chaotic pieces of your family into a perfectly whole and beautiful work of art? Readers are walked through the process using the spiritual disciplines to help you recognize God's presence in your life and regain the balance we all need. In this book, writer, parent, and spiritual director Kathleen Deyer Bolduc -- with honesty and humor, wisdom and wit -- invites the caregivers of children with disabilities to steep themselves in Scripture and self-reflection. • Provides a unique perspective of a parent raising a child with disabilities -- and dealing with it through faith and spiritual direction. • Powerful, insightful, faith-inspired stories of other families who are walking similar paths. • Exercises at the end of each chapter allow readers to reflect to find the beauty in the pieces of their mosaic. Kathleen Deyer Bolduc is a nationally recognized author and speaker in the field of disability ministry. The mother of a young adult son with autism and moderate intellectual disability, she has shared her inspiring story in His Name is Joel: Searching for God in a Son's Disability (1999), A Place Called Acceptance: Ministry with Families of Children with Disabilities (2001), and Autism & Alleluias(2010).